When you need change in your company, strategy and culture are what you need to hit on. Nail that, and organisational change will be direct. Strategy is clear, measurable, and traditional in the sense that it’s been the focus of management studies for much longer than work culture. It is well understood by management and as such it’s their lever of choice to trigger organisational change. Work Culture, instead, is unmeasurable, but is also pervasive. It also doesn’t have the same weight as strategy in management circles. It’s talked about a lot, but because it’s more difficult to understand and manage, it is often “the other” lever for change – the one left to HR to deal with, and usually with little to no budget. Whenever I explore new clients, there is one thing that always shocks me: how they treat work culture. Corporates, who want to keep their identity but also shift towards a more dynamic and flexible work culture to be able to react faster to change and quickly evolve their business model, if needed. “Former” Startups, i.e. companies that have gone over the 50 or 100 people mark and need to keep their work culture alive and not fossilize on their current form. Both of them share a strategic goal to become more adaptable to change and show some awareness (in varying degrees) of the importance of a strong work culture. That said, they also share another train: there is always a clear unbalance between the attention and budget given to strategy and the ones given to work culture. And that is the main source of problems for most companies I work with. Is there a point in leveraging work culture instead of strategy or together with it? To get to the core of the issue, we need a tool. In this case, our tool will be a brilliant study by Spencer Stuart and published on the Harvard Business Review. We said that companies, including the ones I work with, want to move from a more static place to a more dynamic one – and if you look at it on the map above, it means they want to move upwards on the vertical axis. And when they apply their strategy, they bring me in to help their teams and leaders and make them more resilient and adaptable to change – in other words I support them to go from a place of stability to a place of learning. Sometimes though my work completely backfires – and that happens even if my workshop has already proved successful in analogous situations. So, if the strategy is the same, the company type, workshop and goals are the same but the result is different… there must be something else at play here. And that other variable is of course WORK CULTURE. In some cases, the strategy of the company and its work culture are aligned, and both of them move together on the vertical axis, i.e. they both undergo change. In others, though, strategy is given most of the resources and it moves toward a more flexible approach, but work culture is left behind – and THAT is when problems come in! Here are three case studies where too little attention to culture has created a massive liability for the company. A very successful, digital, international company, claiming to have a strong focus on people and work culture, so much that they regularly brought people from different offices together to push the overall unity and provide them with fun events and training. 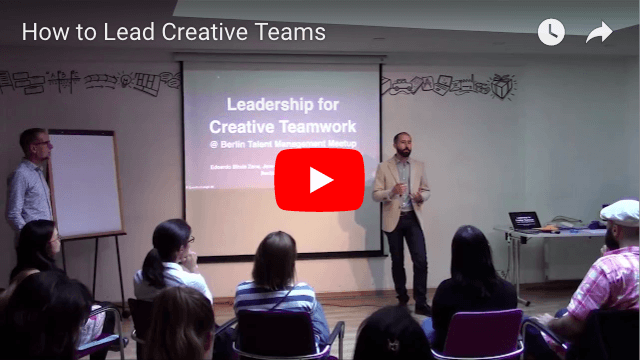 I was contacted by this company twice to organise a few workshops that would fit their needs and culture for those events, specifically to make their teams more united and agile. And in each case the client cancelled the workshop just a few days before delivery because management wanted to focus more on product development and reaching financial goals. So what does this tell us? If you look at the situation through the model. You have a company that presents itself as caring to the employees and to outsiders. When faced with a tough decision, however, your focus goes on product and financials – which means that you present your work culture as Caring, but at the core your work culture is really focused on Results. Being Result-focused is not bad per se, but you can see that there are two cultures at play, and having a split culture creates a strain. This company’s management team and employees work according to two different work cultures. The latter case is by far the worst. For example: if at a certain point you need to choose between delivering results in time or making sure that you provide enough support to your colleagues, what are you going to do? What will you be rewarded or punished for? Having a split work culture creates uncertainty, and that leads directly to wasting time, budget and people, because if the strain is too strong, your talent may just pick up their stuff and leave. 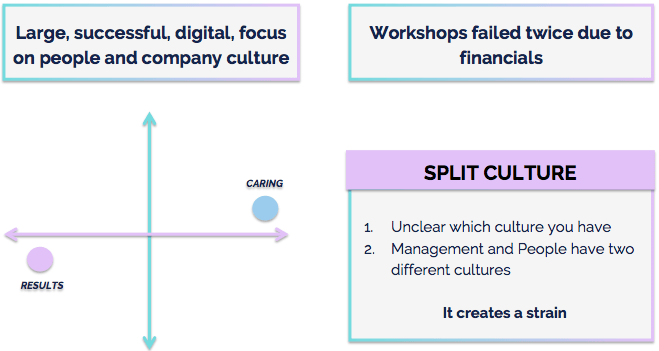 And this specific work culture split, between caring and result-focused culture, is by far the most common. I’ve myself have worked in companies like this where the mantra was “We are a big family, we always care for each other, and we’re here to deliver the best results we can” – which is a blanket statement you can apply to a number of companies – but again: do you prioritize the “family” aspect or do you put results first? A successful company with a skyrocketing growth, putting a lot of focus on how much they believed in the power of people, at the time undergoing a change process to become more flexible and change their work environment to ensure more focus on value creation. In this case, I was brought in to work with the people and reduce the levels of complexity blocking value creation, and to make their new, more flexible work environment more accessible. Focus was on people and leading creativity, and creativity is strongly linked to culture. Again, after preparing a workshop for the company, however my contact disappeared. I actually managed to talk to this person only once, only to hear that they were buried by having to onboard a large number of people and as such had no capacity left to deal with workshops and upskilling. That was the last time I heard from them. Looking at what happened in this company through the lens of the model, then, we have a strategy pushing upwards on the vertical axis – i.e. the company wanting to change to generate more value in complex environments – but a culture that was being left behind. Simply put: HR was not given enough resources to keep up with the changes! And this creates another strain: between leadership and strategy, and work culture. In this case, if the strategy moves away too quickly from business as usual, people will not be able to follow up quick enough, and when they see that behaviours that worked well for years don’t fit the company environment anymore, they will want to leave. And if you pair this with the skyrocketing growth that the company is having, you can see that it creates a huge burden on HR. HR, then, is left to deal with onboarding and has little to no resources left to steer culture in the new direction chosen by management. A small-scale startup with a team of 4-6 developing a product. In this case, I was brought in to provide a workshop on leadership and teamwork in changing environments – which however backfired completely: the team did not want to play along with what I had to offer or to accept what I was presenting in terms of work dynamics. It was one of the most challenging workshops I have ever done. In this situation, it was the CEO that brought me in, and looking at it via the model, he wanted to implement a Learning culture in his company. 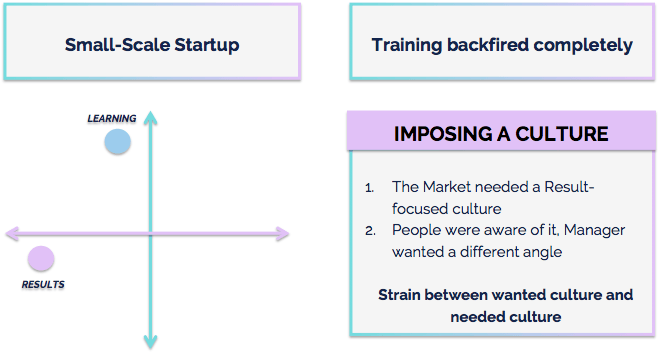 However, being a small-scale startup with a single focus, the culture they needed might have been a Result-focused one: the market requires a result, and the company’s work culture needs to follow what the market requests. What the CEO was trying to do was to impose a culture that responded to what he wanted, but not to what the market needed. My impression was also that the developers were aware of the work culture they needed at a subconscious level and they were ok with that. So, for this company, the strain was between the culture that the CEO wished for, and the culture that the market needed. And as for me and my workshops… well, my presence was not required there and it mostly created a liability in terms of wasted time and money for the company – which is not something I’m ok with causing, either. 1 – A strong work culture misaligned with strategy can be a heavy liability. 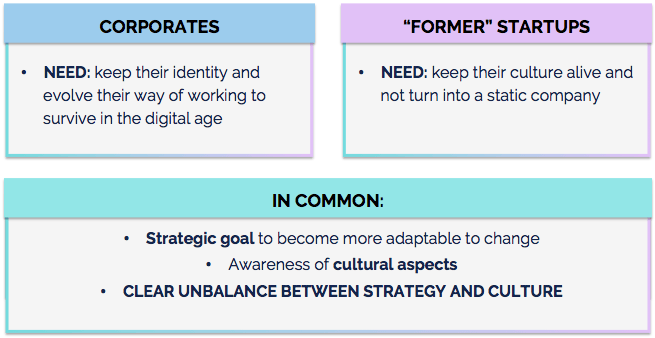 In all three cases, we had a strain between strategy and work culture, more specifically: strategy wasn’t considering cultural aspects enough, and that created strains. And in each case, the cultural strain caused waste in terms of time and money (time invested by the company with me, further burden on HR, money spent for a workshop their culture didn’t need). This can be easily avoided, if you approach change the right way, which brings us to another very important result of the study. they implement changes in processes and structure (i.e. “from tomorrow we will be agile”). And of course they leapfrog work culture aspects completely because the focus needs to be on changing the organisation – i.e. something you see and can measure. What the researches found out, though, is that by working on the culture first, you can drive the organisational changes you need from the bottom up. If you keep strategy and work culture aligned, at a certain point it will be your team to request or apply some organisational changes to allow them to do better work. In other words: you can’t just impose something and expect the culture to follow, but you can work on the culture and listen to what the new work culture gradually requires to function better. So what’s the right way to do it? The researchers that carried out the study identified four steps for moving from a static work environment to a flexible one without causing any strain or leaving your work culture behind. The first step is to literally understand where you are, what culture is prevalent in your company and how it is distributed. For example: do all units follow the same work culture or does marketing focus on results and development on learning? 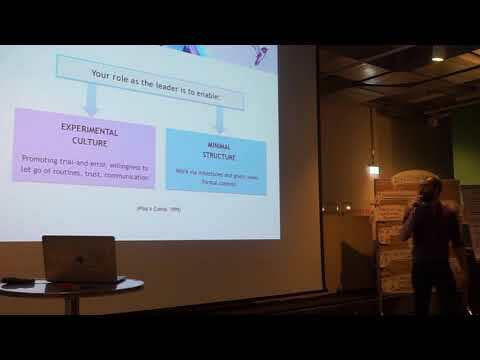 How strong is each work culture in each unit? Once you have that, your second consideration must be “does this work culture respond to the one the market requires?” – for example, if you are moving towards agile and innovation, keeping a culture of order perhaps is not the best idea. Once you know what you have and where you want to go, pin them on the map: those are your starting and ending points. Going from a safety culture to a learning one is a huge step. When the leap is large, it is a good idea to find a leader whose culture is in the middle for this change. If you are going from a Safety work culture to a Learning one, you could well rely on leaders focused on Results. This would break down the change process in two smaller steps, meaning that formal and informal leaders with the right culture would be able to gradually steer people in the right direction by starting to adapt their reward system. In our example, this would mean to reward them for achieving results instead of for presenting well-thought plans (result-based work-culture outcome, vs safety-based work culture outcome). Of course, don’t forget what makes a good leader – and what tools leaders can rely on. Also, if you’re undecided between who to hire or put in charge, remember that there are four behaviours you need to look for, that are proven to be the most important traits for effective leaders – look for them in your candidates! Say you know where to go and you have the right leaders, but you stop there. The only thing people will see is that their leader is behaving differently, possibly in a strange way that doesn’t fit their work culture. If this keeps on going, they may well pack up their things and go. Instead, involve them directly in the process. This tool is literally a map: use it! 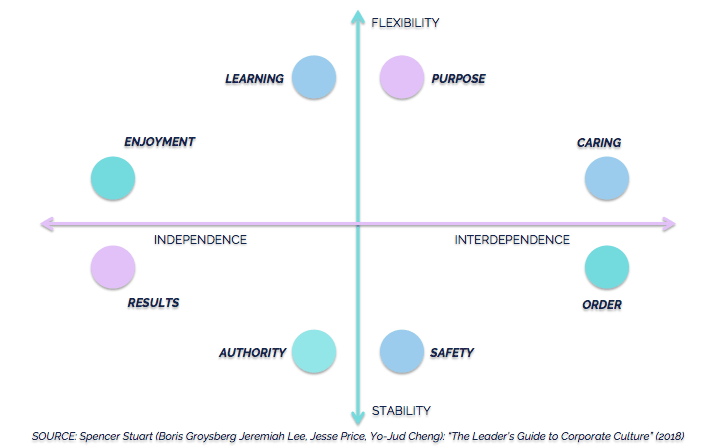 With this tool you can make work culture tangible for your team: they will know what the direction is, and what leaders are doing according to this – and knowing the process will help them accept change much better. This is the step most companies, including the my three case studies, start from… adapting systems, processes and skills. Only once you have the previous three steps in place you can start working on this one, though – otherwise it’s just a patch, and you’d end up in cases similar to my three examples. From my perspective: when I look at the work I do in terms of Leadership and Team Building, this is the moment I should be brought in, not beforehand. The groundwork needs to be ready to bring in a strong change, like a new structure or a trainer – and if you do your homework well, it will be your teams to require said change and point to you what they need – and they would do that because the work culture is there! So what we can do in practice with this model? 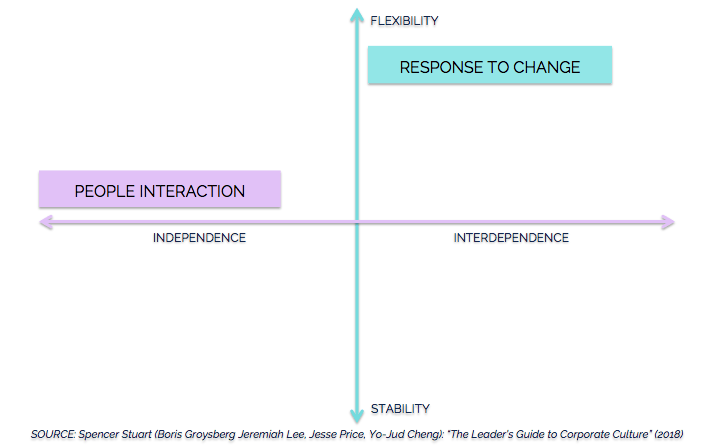 Management can use this tool to visualize and plan cultural change. It’s something that makes culture tangible, physical and maybe even measurable: they can link strategy and work culture much better and identify their trajectory much better. HR Managers can also use this model as a visualization tool for culture, but make a more day-to-day use to map their culture or cultures, quickly find where the strains are – perhaps even independently from management – and be able to make better use of their limited resources to account for more precise interventions in the company’s work culture, thereby reducing losses of money, time and people.